I grew up on Doctor Who in an age before TV series were repeated ad nauseum or easily obtainable on DVD/Blu-ray. So, in the dark half of the year when I couldn’t get my weekly fix of Who, I made to with the Target novelisation of each serial. Luckily our school librarian was very understanding and made sure to buy every single one. After Who limped off our screens with the truly dreadful Survival, I started buying the BBC past Doctor books and following the TV movie, the 8th Doctor books. These newer offerings had much more complex storylines, excellent characterisation and did a wonderful job of keeping the series alive for fans. When New Who burst onto our screens with much fanfare I was ridiculously excited about the prospect of new novels. I grew to like (but not love) the 8th Doctor through the novels, and was looking forward to doing the same with the 9th. Oh, how bitterly I was disappointed. The new novels that followed Series 1 (and I wasn’t thrilled about the re-numbering either) were clearly aimed at the Young Adult market and felt dumbed down in comparison to the novels that had done such a brilliant job of keeping the series alive while off-air. Michael Moorcock’s The Coming of the Terraphiles, published in a separate line from the regular tie-in novels, was an improvement but very much lacked The Doctor despite having more grown-up writing standards. 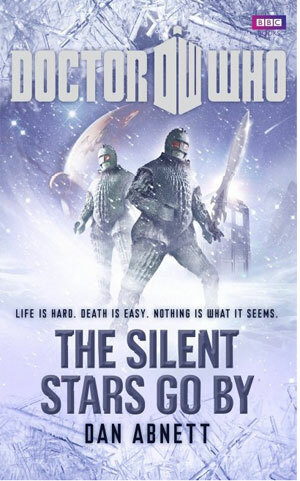 So, if I’m being honest… the only reason I decided to read The Silent Stars Go By is because it had proper old school villains, the Ice Warriors. I should probably stop reminiscing and talk about the book, huh? The Silent Stars Go By has a Christmas special feel to it, but in a good way. This is mainly due to The Doctor initially trying to get Amy and Rory home for Christmas, but also because the TARDIS materlises on a Winter world. The ice planet or Winter world is a familiar trope to sci-fi readers/viewers (hello, Hoth!) and personally, I adore it. You can always have so much fun with it. The settlers of this inhospitable winter world are the Maintainers, who have struggled to build lives for themselves on this new Earth and indeed, to build the Earth itself. They are terraformers. Life has been hard for them, but lately it has been even harder as they seem to be in the grip of an ice age. Winters have been getting colder instead of warmer and now animals and people are disappearing. When The Doctor and his companions arrive they are treated with a great deal of fear and suspicion. Abnett has a great sense of comedic timing and several times when reading The Silent Stars, I found myself bursting out into gales of laughter. His characterisations of The Doctor, Amy and Rory are spot on with nice strong character voices. I’ve read some reviews that criticise the book for having Amy and Rory relegated to the periphery of the book; I very much disagree with this. We follow Amy and Rory separately on several occasions and my belief is that this is a Doctor Who book, rather than an Amy and Rory book, so it’s balanced just right. It was great to see the Ice Warriors getting a new lease of life in this book. I had hoped that when Steven Moffat took over the reins that he’d use them on-screen, but alas, it was not to be. They have such menace, and the details added about their society and culture made for compelling reading. My only complaint is that the final act of the book feels rather rushed, everything seems to be resolved at breakneck speed, but on the whole I found it a fun read with a slightly more complex storyline than the regular line of new Who novels.